A bike-to-eat route offering six delectable stops. be a major undertaking for those who ride regularly. hills, but nothing overly long or steep. It’s not exactly a secret that Portland has become a form of gastronomic nirvana. 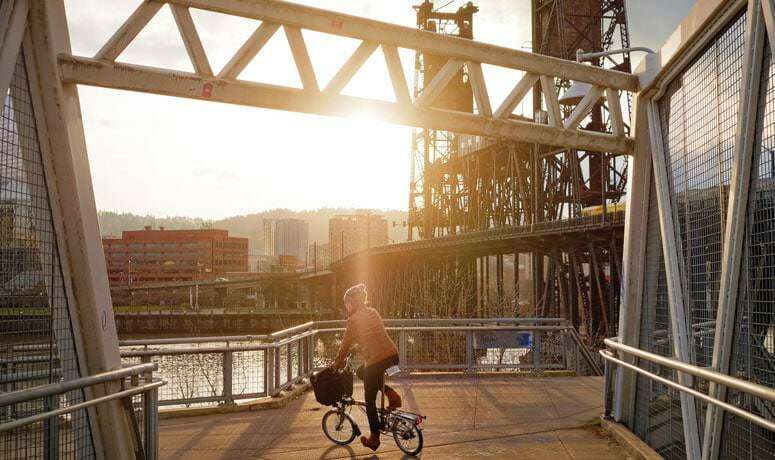 From our point of view, one of the best aspects of this food Renaissance is how concentrated the hundreds of great eating options are in Portland’s relatively small – and eminently bikeable – core neighborhoods. It doesn’t matter what your palate prefers – you can string together a series of culinary delights that also combine to create a great bike ride. That’s because Portland was also the city that pioneered the “bike boulevard,” (these days they’re called “neighborhood greenways,” because they’re not just for bikes). There are well more than a dozen – the number keeps growing – of mapped, signed routes that use lower-traffic streets and traffic-calming engineering to provide a low-stress network through residential neighborhoods all over the city. But there’s more. 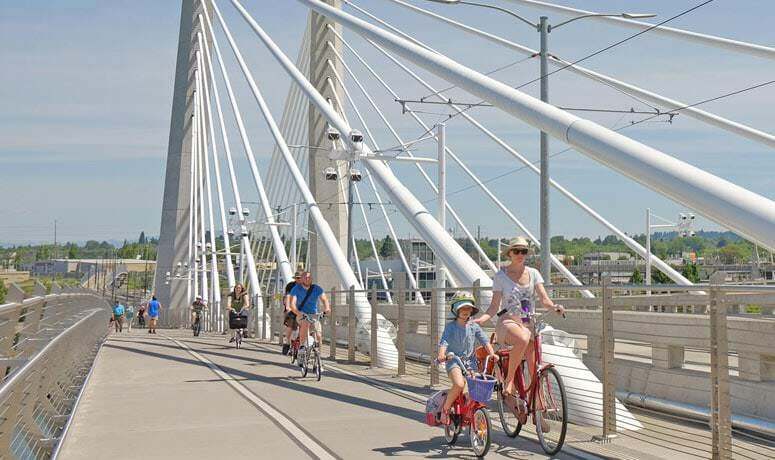 Portland also has built the country’s first major carmotor-vehicle-free bridge, Tilikum Crossing and instituted a highly popular bikeshare program, and there are countless bike corrals and rideable trails throughout the city. So, let’s get specific. 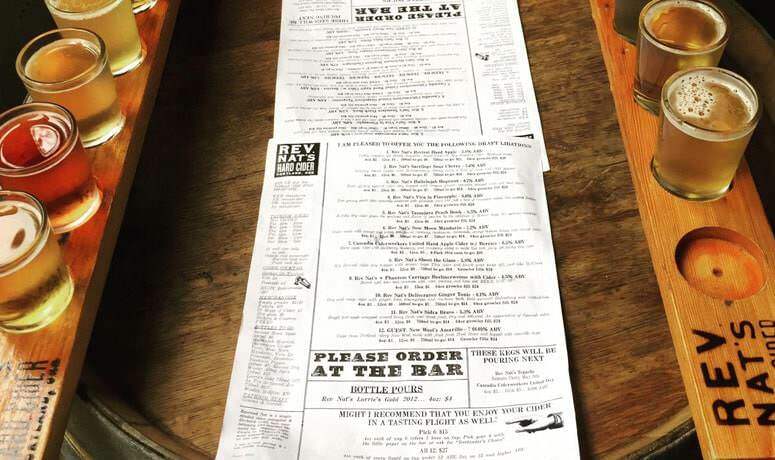 Here’s a suggested bike-to-eat route that offers six delectable stops, all chosen because they are 100 percent gluten-free and considered among the very best choices in Portland for their food or drink. Just in this list you can sample bakery treats, microbrew beer, decadent desserts, a food cart, local hard cider and Colombian cuisine. This is just one example of a route recommended by Bikabout, which chronicles bikeable cities and their highlights. Suggested stops on this easy spin include New Cascadia Traditional Bakery, Groundbreaker Brewing, Petunia’s Pies & Pastries, El Pilon, Reverend Nat’s Cider and Teote. 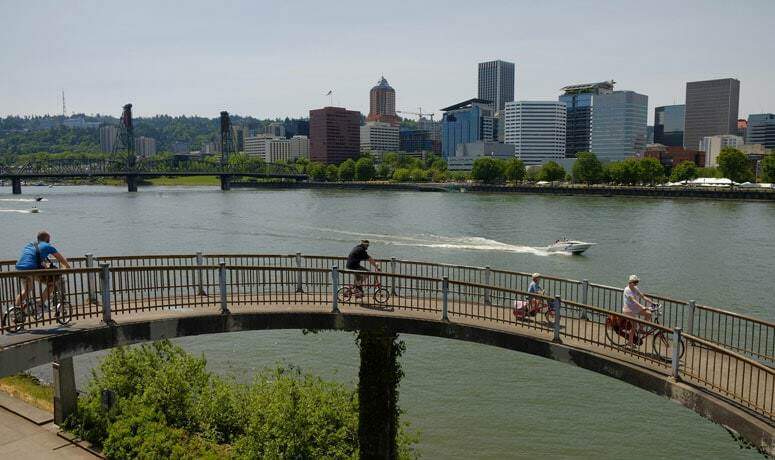 Beyond just tickling your taste buds, this route was planned with another purpose: to take advantage of the views from Portland’s bike-friendly bridges. 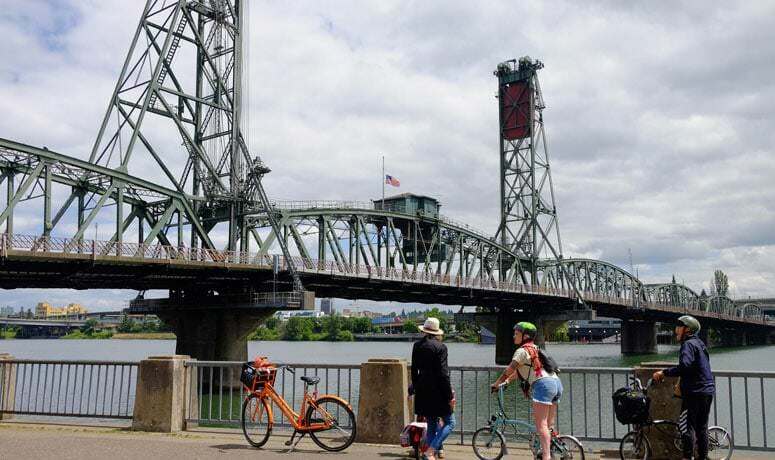 All the bridges on this tour provide some separation from cars, but some are shared with pedestrians, so be sure to be respectful and ring a bell or call out “on your left” when passing. The bridges you will cross include Tilikum Crossing (aka Bridge of the People), Morrison, Steel, Broadway and Hawthorne. And, if you’re visiting and need a bike, Clever Cycles rents famed Brompton folding bikes that come complete with generator lights, locks and a bag to carry your keepsakes and purchases. There’s also the Biketown bike share for $12 per day. This ride will give you a true appreciation for why Portland is most famous for two things: bikes and food. Get out there and indulge yourself in both! In Oregon, a bicycle is legally considered a vehicle, and the same Oregon road laws apply. Please “be seen” and practice safe riding. Vehicle traffic, farm equipment and narrow shoulders exist on many Oregon roads, and you may find that construction projects, traffic or other events may cause road conditions or signage to differ from the map results, ride descriptions and directions. For travel options plus weather and road conditions, visit tripcheck.com, call 511 (in Oregon only), 800.977.6368 or 503.588.2941. Routes listed on this website are for informational purposes and intended as a reference guide only. Bikabout is a free travel site that inspires two-wheeled tourism in North America's best biking cities. 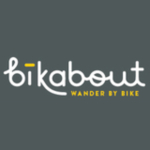 Use Bikabout to plan your next vacation, weekend getaway or day trip.